Setting a realistic budget is an important part of home improvement. Working from home, either full-time or just occasionally, appeals to many homeowners and creating a dedicated home office space can add functionality to a home. A home office may be created by simply turning a bedroom into an office. Or you could convert the attic into an office or add an extension to the home. Whatever your home allows for, plot out your dream home office carefully so you can construct a realistic budget. Like any home improvement project, it’s important to set the budget first before beginning the actual work. Over the past decade, more and more Americans are working from home. In fact, telecommuters outnumber people who travel to work in 38 of the 52 U.S. cities with more than one million residents. (source: Forbeszfbzcuyqsybrvyararsyawfcfawwursr) That leaves a lot of Americans needing a dedicated room for their home office. According to the US Census Bureau, 13.4 million workers reported working at least one day a week at home, up from 9.2 million in 2007. This survey also noted that people living in the Western states were more likely to work from home. According to Remodeling Magazine, the national average cost for a home office remodel, which includes adding cabinetry, carpeting, and data communication upgrades to a 12 foot by 12 foot room, costs $28,000. It is estimated that only about 49% of the costs will be made up at time of sale, making this home improvement project not as valuable compared with deck additions, kitchen remodels or attic conversions. Of course, actual costs and return on value percentages will vary greatly depending upon where you live. In the Pacific region, for example, home office renovations have an average cost versus value of about 61%, in the Middle Atlantic region it’s about 42%. It’s helpful when planning your budget to take a look at your neighborhood. If most of the homes in your neighborhood have a dedicated home office, it may be worth having a dedicated space in your home as well. This will keep your home competitive in the market. Understand your neighborhood better by downloading the free Porch Home Report for your home and listed homes near you. Keeping your remodeling costs comparable with your neighbors will enable your home to be competitive on the market as well. Be mindful of the idea of sacrificing a bedroom to have a home office. If you think losing a bedroom in your home would be detrimental, consider a minor renovation in which your home office could easily be converted back into a bedroom. If your home was originally sold as a 4 bedroom home, for example, you’ll want to be able to sell it again as a 4 bedroom home, not a 3 bedroom home plus office. Before you can set your budget, you’ll need to make a list of priorities for the space. Do you need to install specialized data lines, cable or separate telephone lines? Do you need more than one person to work in this space? Do you require storage for specific items like books or files? Is this home office also a hobby or craft room space? By making a specific list of needs as well as wishes, you’ll be able to start deciding who will be doing the work, where the items will be purchased, and what the price ranges will be for both materials and labor. If you know your budget is tight, make two lists: one for now and one for later when you can spend additional funds. Start by asking yourself a few questions so you know how to approach your remodel and build a reasonable budget for your new home office. Why am I doing this remodel? How long do I plan to stay in my home? How much can I afford to spend? Should I hire a pro or attempt to DIY? In general, home office renovations don’t have a huge return on value at time of sale. This shouldn’t stop you from creating a home office; instead, use this information to set a realistic budget for your project. If you are planning a more complex office addition, such as converting an attic or adding on to your home, you’ll want to start working with a professional who can help plan out the construction, permitting and design process. 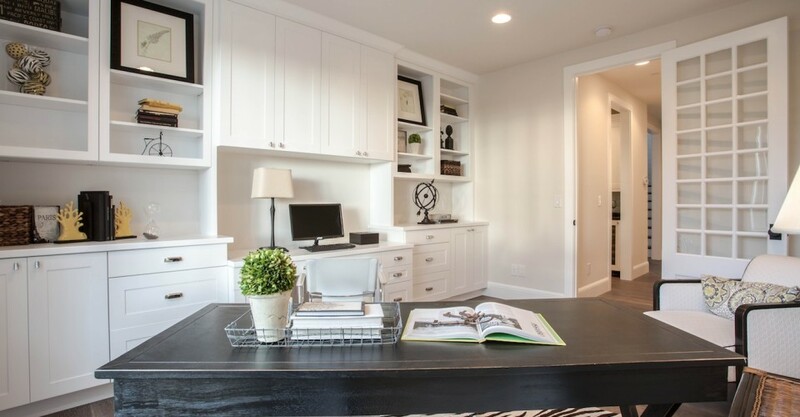 Because home office designs vary greatly, it’s a good idea to think about what elements need to be present in your home office space. In Remodeling Magazine’s example, their costs are determined by remodeling a 12-by-12-foot room into a home office. It also includes installing custom cabinets to include 20 linear feet of laminate desktop, computer workstation, and wall cabinet storage. Rewiring room for computer, fax machine, and other electronic equipment, as well as cable and telephone lines. It includes drywall interior, painted trim, and commercial-grade carpeting. Custom cabinetry generally has the greatest cost for materials, but the labor costs aren’t as high as electrical – which has an inexpensive material cost but high labor costs. If you are simply converting an existing room into a home office, and don’t need to carpet or paint, your office renovation may simply be a matter of installing additional cables and purchasing furniture. It’s always recommended to set aside 10% – 20% of the budget for unexpected costs. You may find structural damage that needs repaired, or you may need to pay for expedited shipping on materials. Regardless of the issue, budgeting for unexpected costs is a responsible part of home ownership. After establishing the budget, determine who will monitor costs, expenditures and keep track of the budget. If you’ve chosen to work with a professional, like an interior designer, he or she will most likely monitor the day-to-day aspects of the budget. Regardless of who is in charge of the project management, it is always the responsibility of the homeowner to monitor where the money is going. Checking in with your professional on a regular basis and getting a budget recap is a smart way to stay on top of your money. It’s easy for a home office renovation to develop scope creep – the idea that the project becomes bigger, and more expensive, than originally planned. Your pre-planning needs list will come in handy so you can make sure you are staying within budget. If your home office isn’t used full time, be sure you aren’t developing an office that is overly-designed for its use.